How to regain control of your vehicles with GPS Vehicle Tracking System? You were sold the idea that vehicle tracking would help you monitor your fleet/drivers and cut operational costs. You are now planning to buy and install a GPS Vehicle tracking system for your vehicles, and you realise that it is a significant investment and it should be 100% worth your money. GPS vehicle tracking system can be an extremely valuable tool, but it depends on the system you choose to work with. A well-developed system will give you the data and fast access to operational intelligence in order to help your fleet operation stay competitive. Such a system would help you create real-time mashups with live data in order to view important indicators in real time. Then, how do you decide what to buy? Well, it turns out you would need to look out for the following points before you make that important decision. It would not only save your investment but would propel your fleet operation to new heights also. If you want to realize the benefits that fleet automation can have for your business, then contact us today. What to look for in a GPS vehicle tracking system? 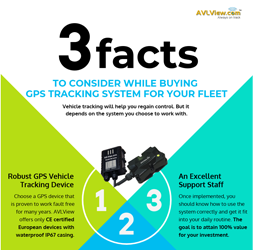 Fleet owners often have been fooled (by some of the GPS tracking vendors in the region) mainly due to lack of awareness. These vendors seem to find ways to get prospects (vehicle owners) to their net, sell them on a GPS tracking device at a low price, and then change the rules when support calls arise. They also offer cheesy GPS vehicle tracking software platforms that do not solve real fleet operational challenges. We’ve heard of horror stories of the types (GPS tracking service providers) who woo fleet owners, make a sale at a low price and then disappear. Managing fleet is like herding cats. 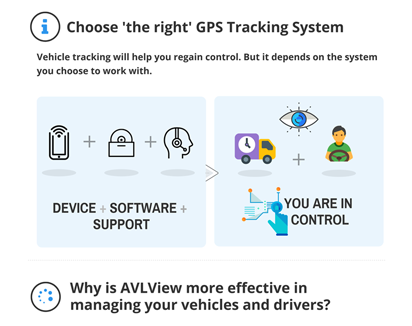 Many of the tools available in the market (Vehicle tracking software) are pretty basic, and nearly all of them focus on just one challenge, i.e., locate vehicles on the map. None of those tools address real fleet operational challenges faced by the vehicle owners like you. 2. A well-developed vehicle tracking software that can resolve your fleet operational issues; remember, just tracking the vehicle is not enough; the platform should actually use that information to help you automate your fleet and cut operational cost. 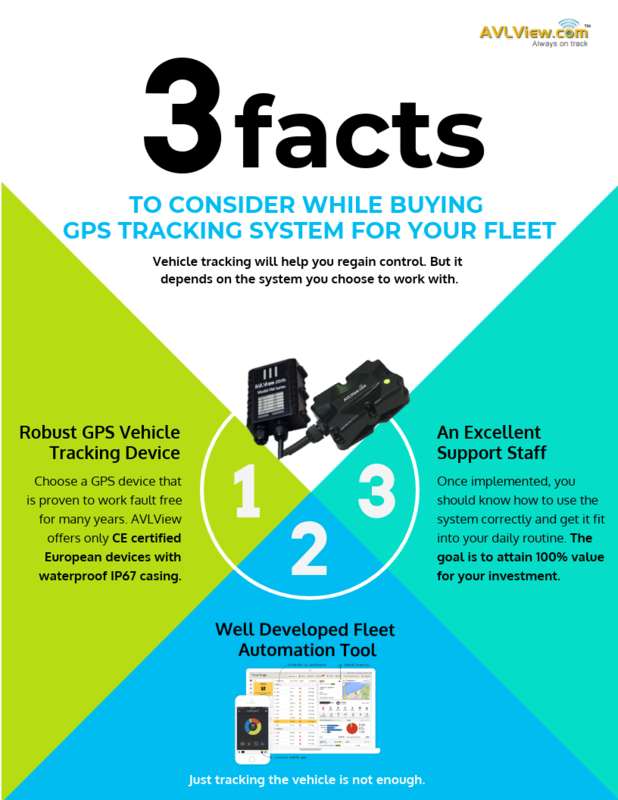 If you want to see all the improvements that convinced you to make the investment in GPS tracking to begin with, then you may need to upgrade to a fleet automation system. 65% of our clients have had vehicle tracking system done by other service providers and failed. Our team helped them all to move from chaos to control. If you are looking to get the most out of your GPS vehicle tracking investment, you will want a solution that can help you squeeze the maximum ROI. 1. 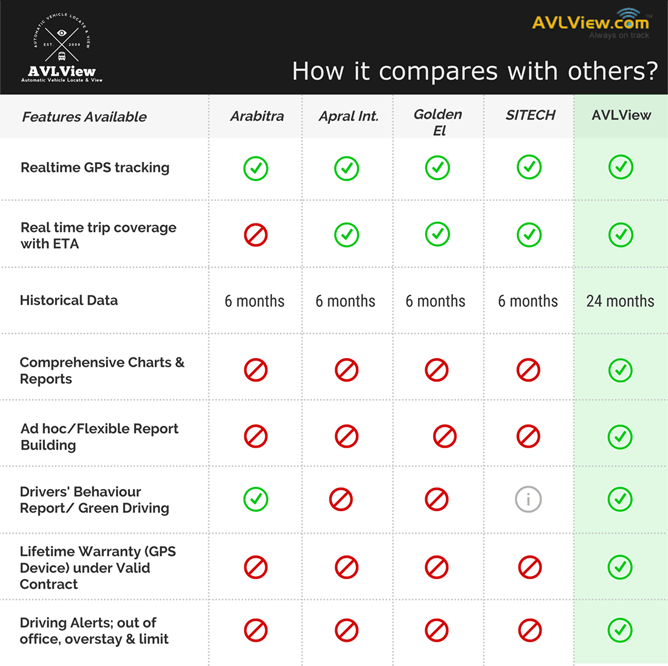 AVLView supports over 30+ robust GPS tracking devices. You may choose from the recommended list of GPS devices that are time-tested. 2. BYOD support, meaning you may bring your own GPS device or transfer a GPS device from a GPS vendor to AVLView platform. 3. Loads up quickly even if you have 1000s of vehicles in your account. Thanks to the platform that is built to scale with the backend engine developed in new age NoSQL. 4. It helps to gauge vehicle utilization so that you may rightsize your fleet. 5. You may schedule trips and book delivery jobs in advance. This involves combining orders with routes, shifts in such a way that total costs are minimized, relevant business rules and service constraints are satisfied. 6. Regular service and maintenance is the key to keeping your trucks running well. AVLView service schedule would help you take the guesswork out of maintaining your trucks. 7. AVLView simplifies operational intelligence by letting you connect to multiple data sources, and manipulate live data to get the answers you need. The intuitive wizard-driven tools make it easy to bring together data to respond to changing conditions as they happen and create meaningful data visualizations. 8. The surveillance of the fuel consumption and fuel tank level becomes critical to catching thieves in their act. With AVLView fuel monitoring ensuring upto 98% accuracy, you won’t be disappointed. 9. It is important to profile driver behaviour as it strongly impacts traffic security and causes the vast majority of motor vehicle accidents and the list goes on..
AVLView is highly configurable and provides accurate reports, timely data, and robust mapping capabilities that help you to analyze a broad range of metrics to manage your fleet operations correctly. Live Vehicle tracking offered at the lowest price comes with an excellent after sales support. Result? Value for your money that is well spent. It is easy to use, powerful and quick to set up. A set of some amazing tools that help you take control of each area in fleet management. It is custom built vehicle tracking with tools that help your business either big or small to focus on your core area, cut costs and grow FAST. 100s of companies placed their trust in us. That trust is passed on to our staff, who then give it back to clients. Clients then refer their friends to use our services. 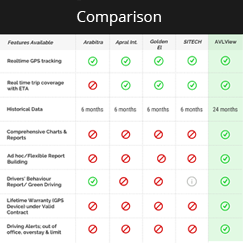 AVLView vehicle tracking brings a sense of serenity as soon as you use it for the first time. You will find that it is a quick way to take the fleet operation to the next level. The problem with GPS tracking is its only part of the puzzle. You need another piece to see the whole picture of GPS benefits. That missing piece is a Fleet Automation System. A partial list of our awesome clients who are convinced of the value. Read how fleet automation helped achieve results for these clients. You too can. We feel more relaxed these days. ‘Trip Schedule’ feature helped us tremendously to plan our day-to-day goods delivery on time. We never thought a new technology such as this is so easy to use. We gained overall control over our fleet. It helped us to better our operations & services. No longer do I wake up with worries of what my staff have been doing overnight. We smoothed our process from invoicing to post sales. Thanks to AVLView. We used to be anxious while our vans leave currency chest, until they reach destination. No longer are we, thanks to AVLView, we now track our vans live all the way down. Student safety stands top on our priority list. With fleet automation, no more rash driving complaints on our desk,, we know how our drivers perform their duty; AVLView does the job for us.